The Yankees need another starter, and their ability to obtain one will determine their chances at winning a 28th World Series. Cashman believes the Red Sox are a better team on paper, but feels the addition of Soriano gives the Yankees a better bullpen. Joba Chamberlain has been limited since his injury in 2008, and as a result, the organization’s plans for him have been altered. Derek Jeter is not expected to remain at SS over the entire length of his current four-year extension. Being a general manager in New York is hard work. Is Brian Cashman Fed Up Being the Yankees' GM? Although some of Cashman’s candor was worthy of a raised eyebrow, none of the opinions expressed were particularly groundbreaking. The revelation about Chamberlain represented the first time the organization has used injury as justification for its handling of the once prized pitching prospect, but otherwise, most of the observations were fairly benign. One remark that was somewhat of a concern, however, was Cashman’s comment about the media in New York having the ability to “wear you out”. Taken alone, it’s really a very mild remark, but in the context of his conduct this offseason, it does make you wonder about whether Cashman really wants to be in New York after his contract expires in 2011. Last week, New York Daily News columnist Bill Madden wrote about Cashman possibly wanting to leave the Yankees for an opportunity in which he would have less scrutiny and more autonomy. Also hinted at in Madden’s column was Cashman’s desire to operate without the “burden” of the Yankees’ significant financial resources. In a sense, it seems as if Cashman wants to make it on his own…almost like a child of wealth might desire to get out from under his parents’ shadow. Although Cashman has sometimes bristled at the implication that his success is directly the result of the team’s high payroll (usually by doing so in a self-deprecating manner), he has always seemed content toeing the party line. In fact, Cashman has developed a politician-like reputation for being able to say nothing by saying everything. However, that has all changed this offseason. 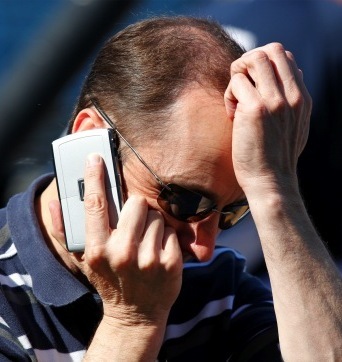 Cashman’s conduct during the Derek Jeter contract negotiations was the first sign that something was amiss. Not only did the Yankees’ GM take an early hard line with the team’s superstar, but he also openly discussed the negotiations, even going so far as to lob a few criticisms in Jeter’s direction. Then, after adamantly stating that he would not surrender a first round pick for Rafael Soriano, Cashman was overruled by Hal Steinbrenner, and wasn’t shy about saying as much during the reliever’s introductory press conference. When Cashman talked about having Soriano “forced down his throat”, he was trying to make a point about the positive influence of the Yankees’ resources, but the way he chose to express the thought didn’t seem very flattering. One can get carried away reading too much into comments, but in this case, it seems like something is up. Is Cashman fed up with the Yankees, and New York in general? Is he tired of the scrutiny and weary of being thought of as “director of spending” (as Madden claims he referred to himself at the recent Winter Meetings)? Does he feel diminished by ownership’s intervention in the Soriano signing, and perhaps even the Jeter negotiations (and, by extension, could there be a split between general manager and short stop)? Finally, has the charm of being a smaller fish in a big pond worn off now that the Boss is no longer the head shark? Regardless of the reason, if Cashman is strongly considering a change of scenery, the Yankees have to consider how that realization will affect his approach during the season. I’ve always been a fan of Brian Cashman, and see no reason why the Yankees should look to make a change…unless, their GM has already made that decision. If Cashman really would prefer the challenge of a smaller market team with less pressure, less media and less money to spend (i.e., a pasture with less “green”), then it might be better if he and the Yankees part company sooner than later. The Yankees not only have significant challenges facing them before the start of the season (and likely leading up to the trade deadline), but there are also some long-term transition issues slowly emerging. The Yankees need to make sure their general manager is committed for the long haul, and if not, the team might be better off finding that out now. In a perfect world, the best approach for the Yankees would be to offer Cashman a “take it or leave the organization” contract extension. Because of his long and meritorious service to the organization, however, Cashman deserves the benefit of the doubt as well as every opportunity to decide upon his future. Having said that, it might be time for Hal Steinbrenner and his general manager to have a frank discussion about each man’s respective vision for the future. If it is determined that both paths will not converge, then Cashman and the Yankees might be better off going their separate ways. If Cash Money does NOT want to leave, there is no rational explanation for his various comments this off-season…if he goes who will replace him? Is Gene Michael still spry enough to a caretaker GM? I can’t understand his tact this off season either, but he did back kind of affirm his commitment and desire to remain with the Yankees in a radio interview with Michael Kay. Gene Michael’s days as a full-time executive are probably over, so after Cashman, the Yankees will probably have to look from outside the organization. Even joking that makes me shudder. inept, incompetent and a moron. Congrats William, the Captnsblog now so popular you’re getting the WFAN Vinnie from Queens audience checking in!